Reports say Qatar to give Hamas monthly cash infusion on Thursday as part of long-term cease fire. Qatar is expected to deliver its monthly $15 million to the Hamas terror group on Thursday as part of Israel’s efforts to rehabilitate the Gaza Strip. 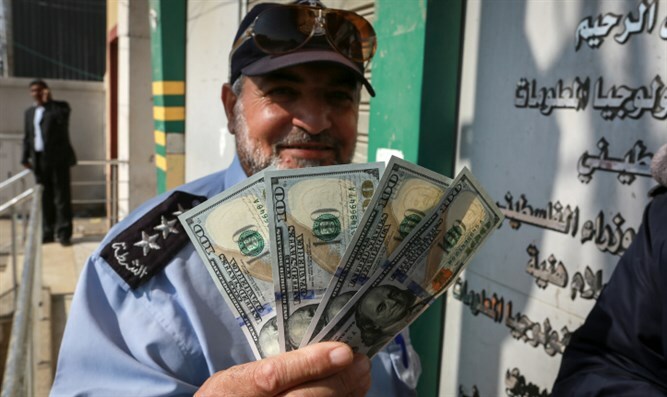 The injection of foreign currency will allow the Hamas leadership to pay salaries to some 30,000 officials across the Strip, as well as payments to the family members of those killed and wounded by the IDF. The Ramallah-based Palestinian Authority has denied funding to officials in the Hamas-ruled Gaza Strip, after Hamas failed to reinstate PA control over the coastal enclave following last year’s reconciliation agreement. The PA has also refused to fund transfers of electricity from Israel to Gaza until Hamas relinquishes control over the Strip. The first installment was controversial, as Hamas shot more than 500 missiles at Israel only two days after getting the cash last month. The funds were delivered into Israeli territory from Jordan, through the Allenby Bridge, and then relayed into Gaza through the Erez Crossing. The transfer was agreed to after Palestinian Authority (PA) chairman Mahmoud Abbas refused to pay the salaries of PA employees in Gaza. Israel agreed to facilitate the transfer on the condition that it be carried out by the UN. Former Defense Minister Avigdor Liberman, who bolted the government last month over a ceasefire agreement with Hamas, had criticized the original transfer of Qatari money to Gaza, saying the funds would eventually be used to support Hamas’ terrorist operations against Israel. Qatar, which has poured billions into Gaza, is home to former prominent members of Hamas including ex-leader Khaled Mashaal. Reports on Thursday said that Qatar had only agreed to transfer the money if Israel would publically thank the Gulf state for its efforts. In an irregular tweet, Israel’s Ambassador to the US Ron Dermer thanked Qatar earlier this week for its efforts to stabilize Gaza. “The Government of Israel thanks the UN’s Mladenov, Egypt and Qatar for their efforts to improve the situation in Gaza and hopes that a long term agreement can be reached that will both maintain Israel’s security and enable Gaza’s development,” wrote Dermer.